As usual we were using rules and lists from the NetEA website linked in the sidebar of this blog. My force focused on lots of the heavier ground units including an Aeonic Orb. 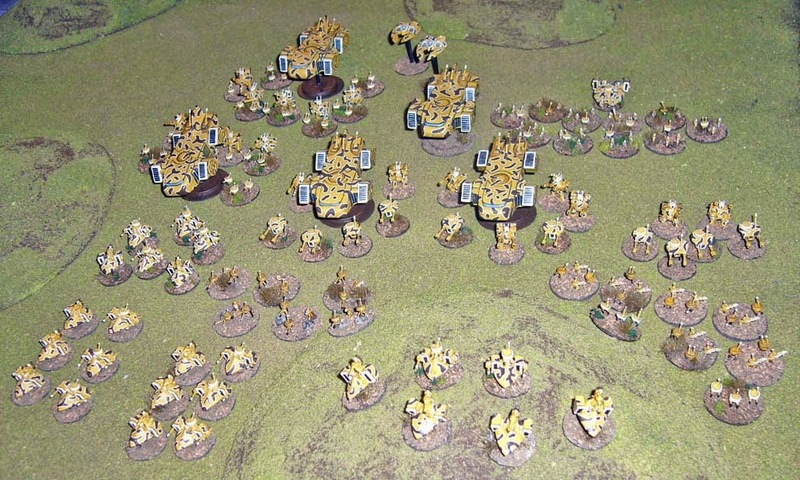 I took no air defence Pylons, figuring I would just weather any air attacks relying on armour, and concentrate on hit and run elimination of Tau units in a war of attrition. I was rather shocked when I realised that Andrew had taken FIVE Orca air transports plus fighters! Oh no... My Tomb World for a Pylon! I also used the Epic UK version of the list, to try out the slightly simpler and perhaps not as powerful Living Metal Rule. Andrew had been busy since I last played him, adding to his fleet of Orca Dropships. As I found out later he had also been doing some extensive planning on how to fight the Necrons! 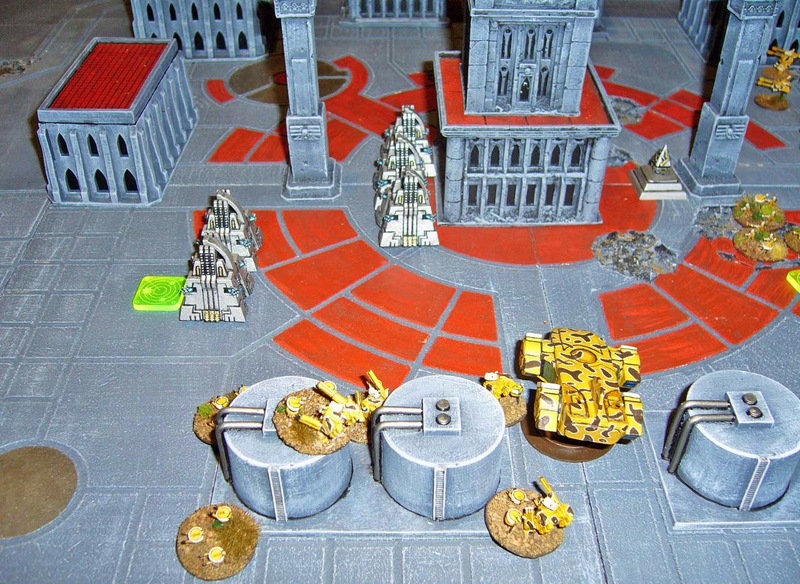 See his pre-battle planning report here, done in excellent Tau character as usual! 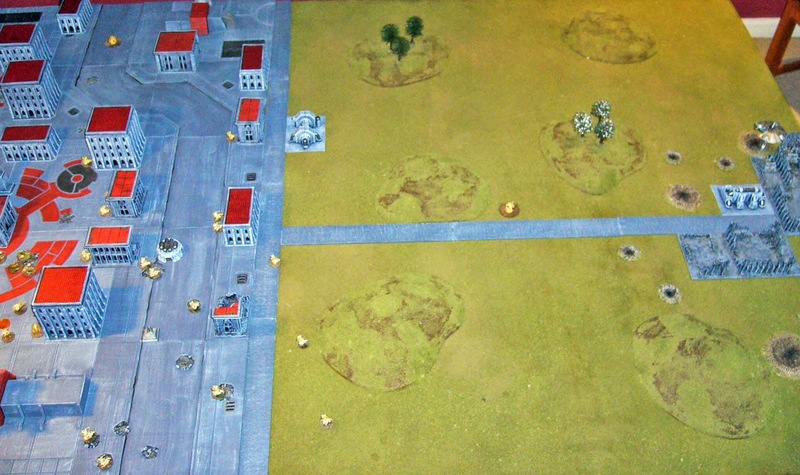 Here's an overview of the battlefield which had a city at one end and a small installation at the opposite end. 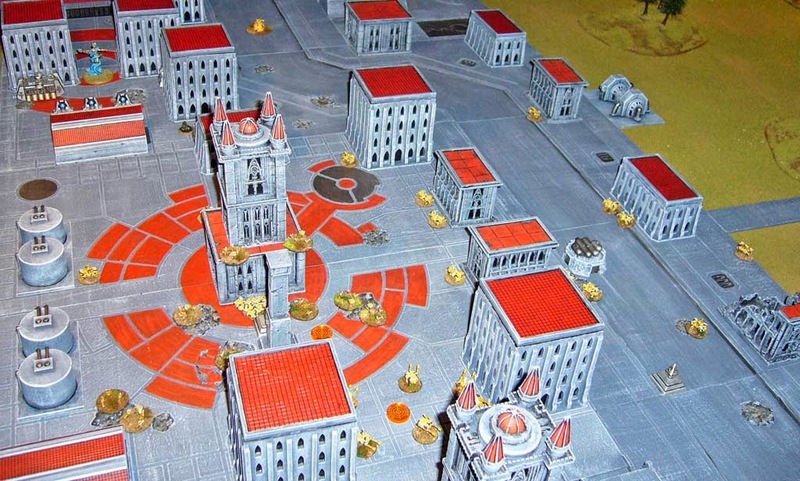 Buildings are mainly a mix from Battlescene Designs, old Forge World Buildings that are no longer available, and the cityscape panels are from an Australian company (can't remember who right now?!). 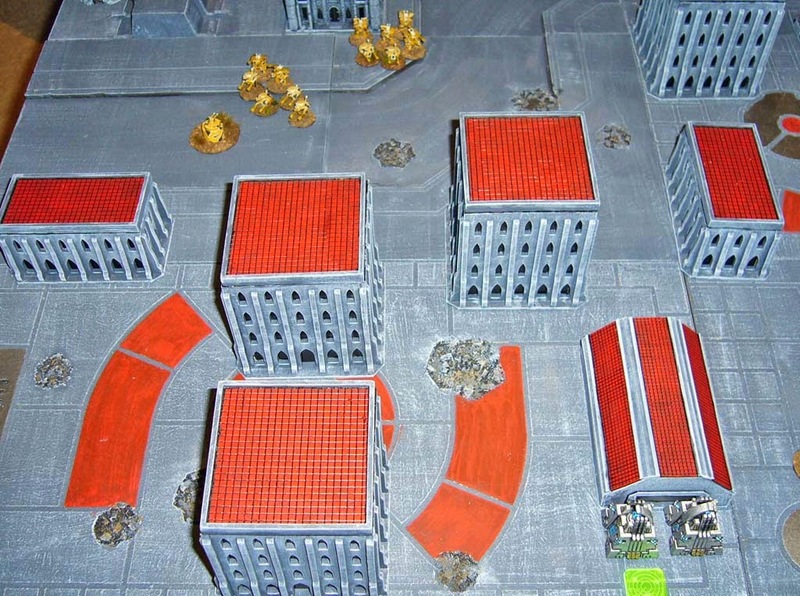 The Tau chose corner deployment in the city. 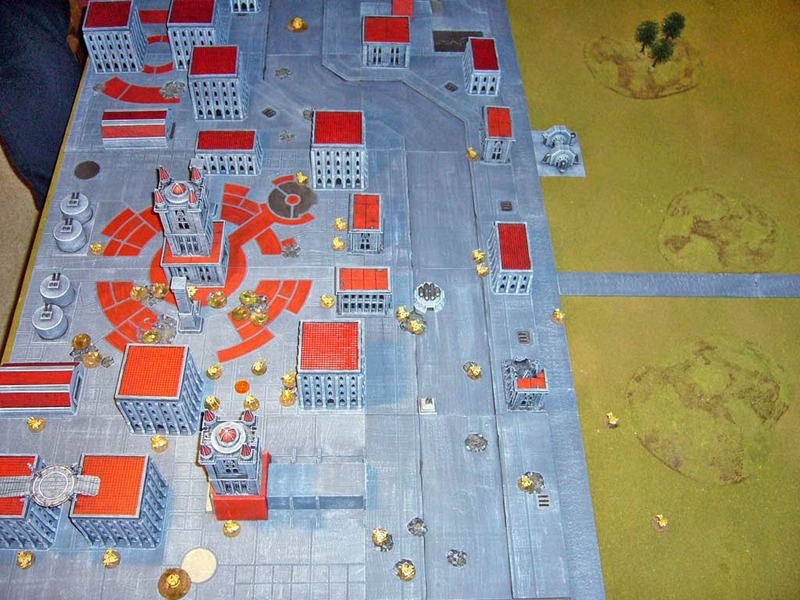 They spread out garrisoning with Recon formations, in addition to a Broadside formation and the Firewarrior formation on overwatch near the city centre. 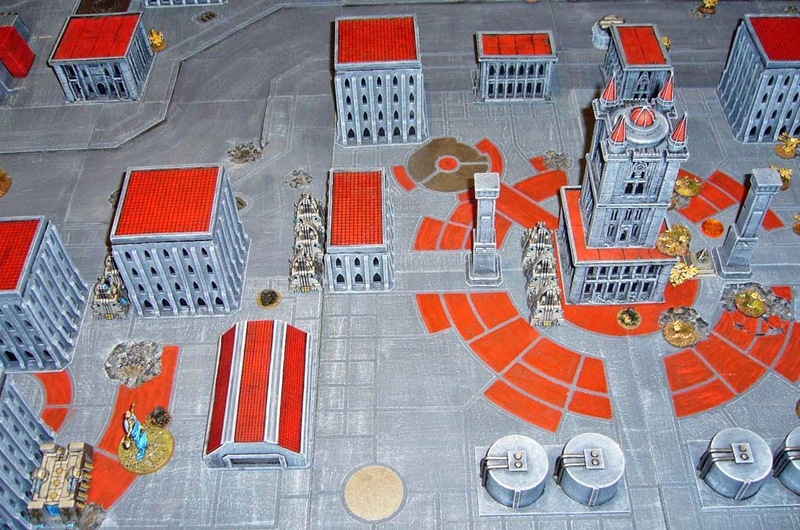 Four of the six objectives are in the city. 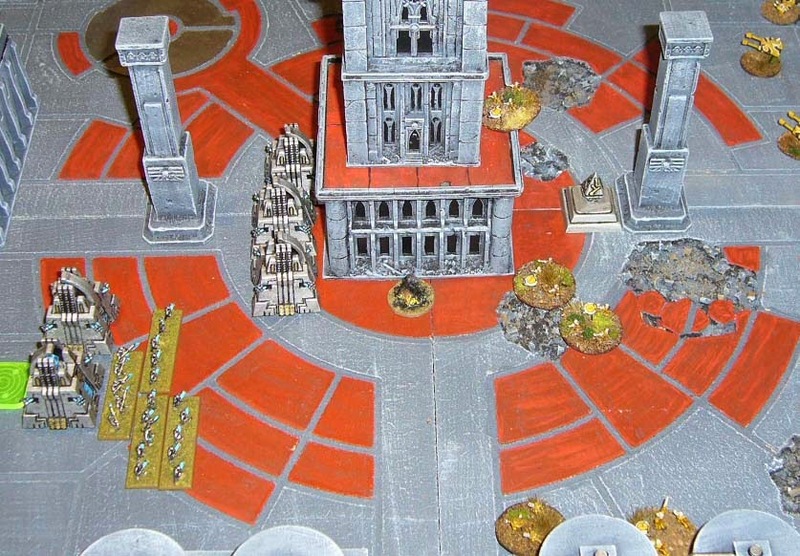 I start the game with only a Monolith Formation and my Aeonic Orb on the table. Everything else is in reserve waiting to teleport or portal on. To be honest I have no idea what to do! 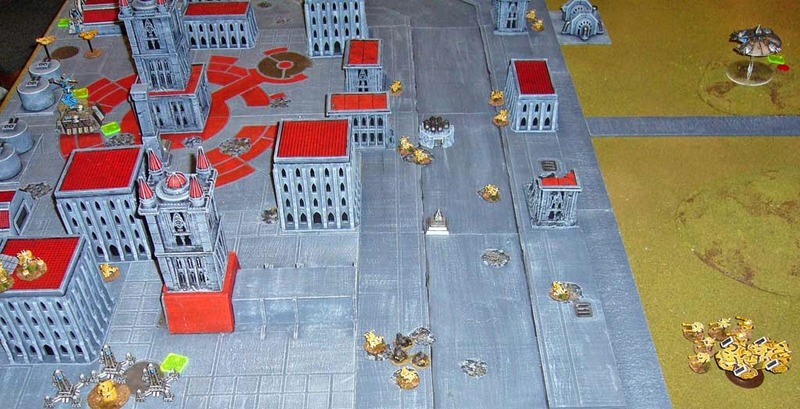 I oscillate between a massive first turn teleport and assault, or waiting around to see what happens and then committing everything on turn 3 to try and grab objectives when the Tau are spread out more. 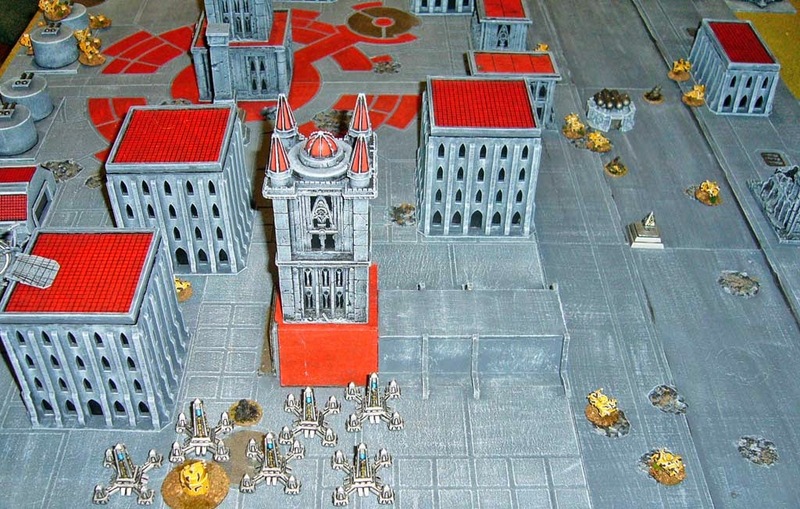 After some hesitation, I decide that waiting is not really an option as the Tau will just get themselves into better positions and setup in overwatch. 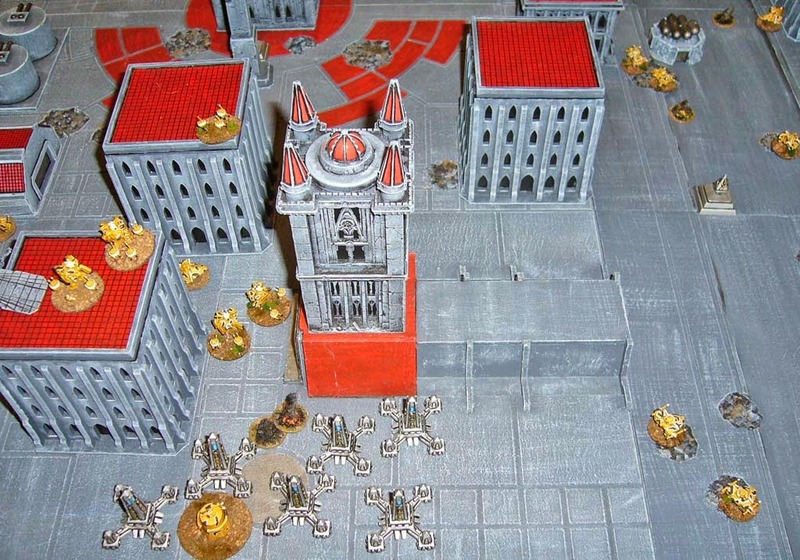 So decision made I teleport the bulk of my forces into the city ready to begin a rolling assault towards the objectives. 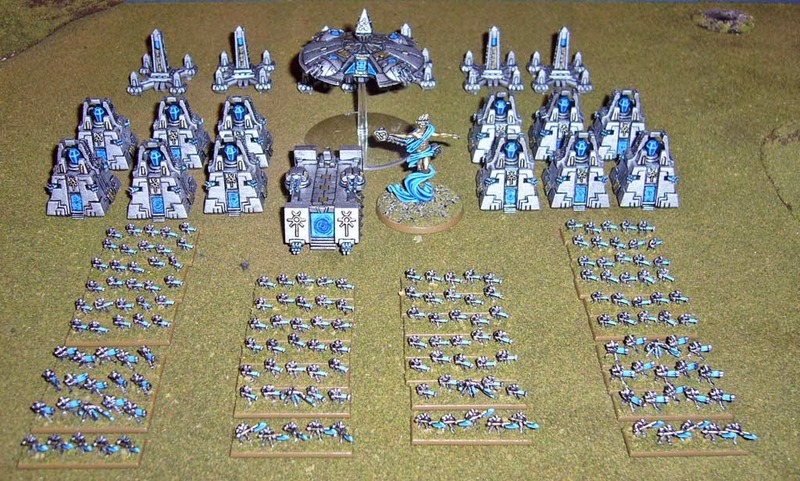 The necrons can be seen in the top left of the photo below. 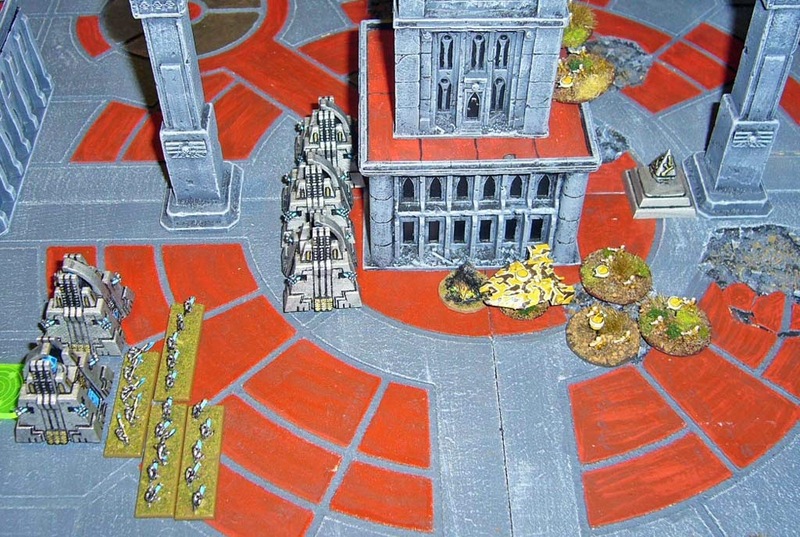 Here's my Necron formations in the city, The Deceiver, Warbarque and 3 Monolith maniples. I win Strategy Roll. My first action is to portal in a large Phalanx which engages and destroys a Tau Recon formation without loss, before exiting via another portal back to their stasis chambers. I then try to retain with the Deceiver, hoping to blast the overwatching FireWarriors. However he fails his command roll and his reroll (double one!) and so he just moves up behind some more monoliths. (Incidentally you can see that I have turned some of the monoliths around to show that their portals have been used this turn). 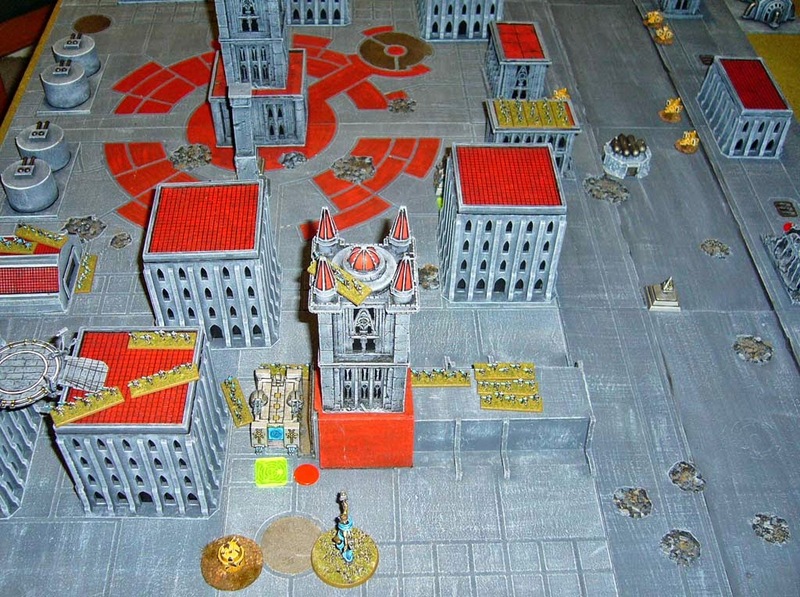 I can't remember what the Tau did here, but possibly they failed an activation or whatever happened it wasn't of much consequence. 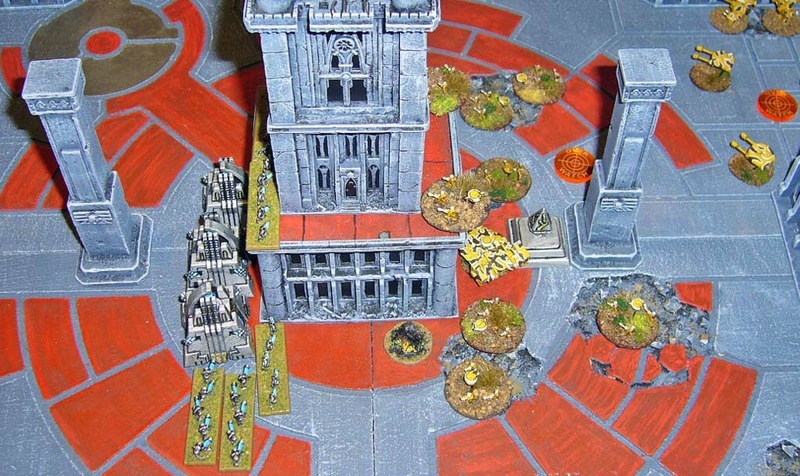 In any case it's my action again so I double a Monolith formation up to the city centre, firing and putting a blast marker on the Tau Firewarrior formation here. 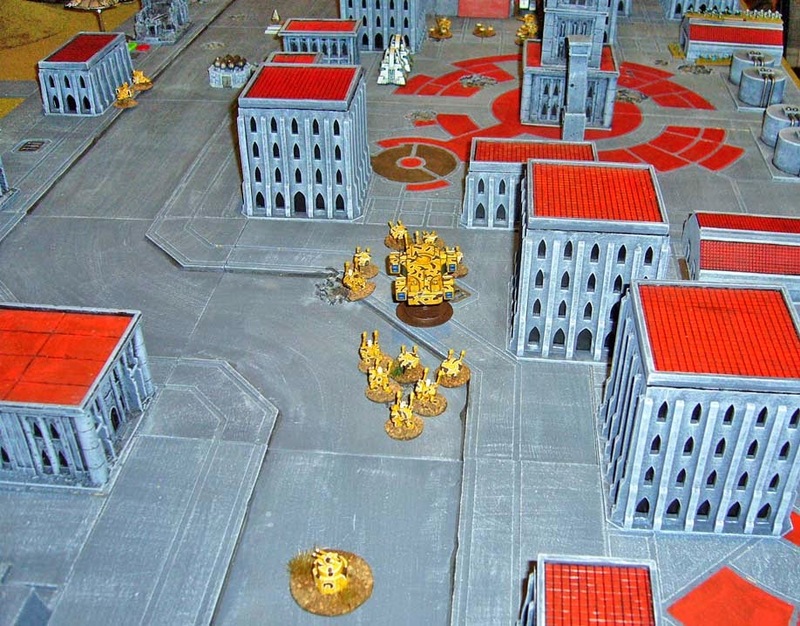 My next large Phalanx tries an engage action against the Firewarriors. 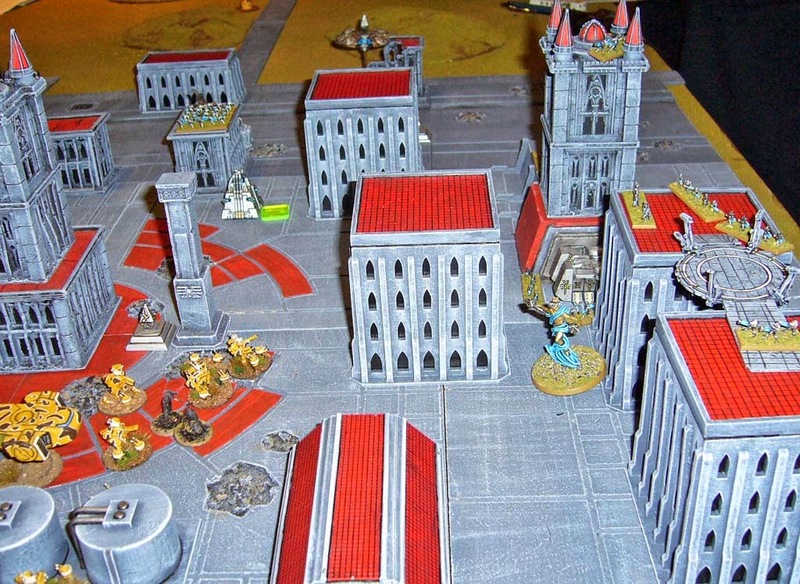 This goes disastrously wrong as the Firewarriors are on overwatch and kill five Necron units including the Lord and Pariahs (who are taken out by sniper fire!). I break before I can engage and retreat back through another portal into stasis. I really underestimated the firepower of the Tau formation! 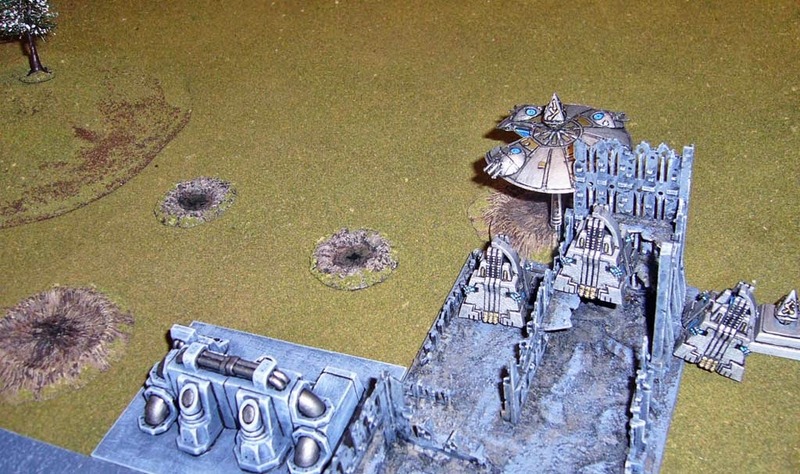 A Tau Recon formation sneaks up behind the circular storage tanks and shoots the Warbarque placing a blast marker, and marking it and the Deceiver in preparation for seeker missiles. My Warbarque fires back, killing one of the Recon formation. Then in comes the first Orca behind me carrying two Broadside formations! Thankfully they miss with almost half their shots (needing 2's to hit!) and I only lose a single Monolith. 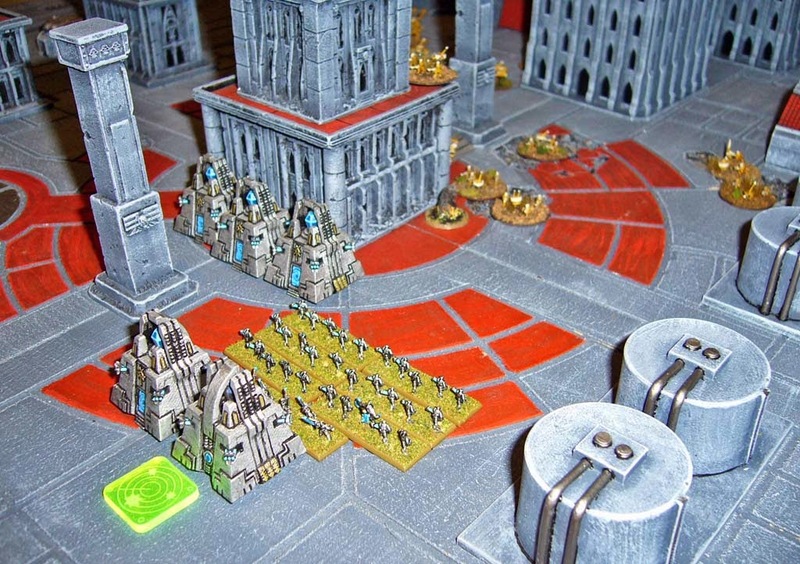 The broken Monolith Formation skims away from the Broadsides and towards the city centre, unable to fire or fight but still able to use their Portals. 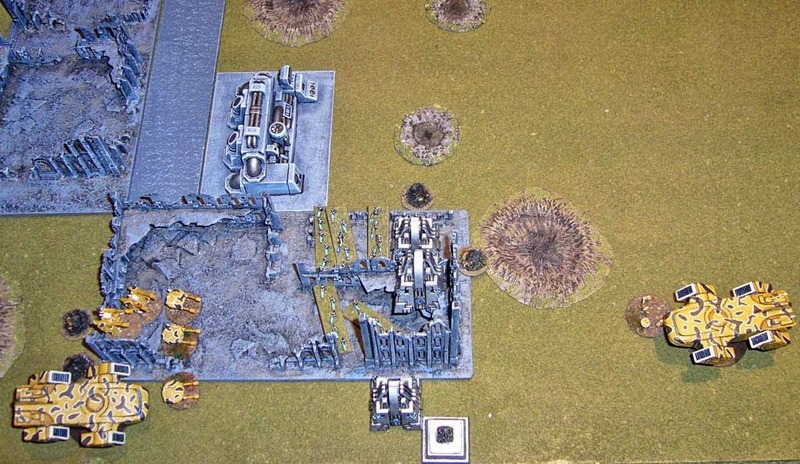 Another Necron Phalanx emerges and engages the Firewarrior formation again, with support from the undamaged Monolith formation ahead of them. The first round of combat is a draw and I've lost 3 units of necrons! 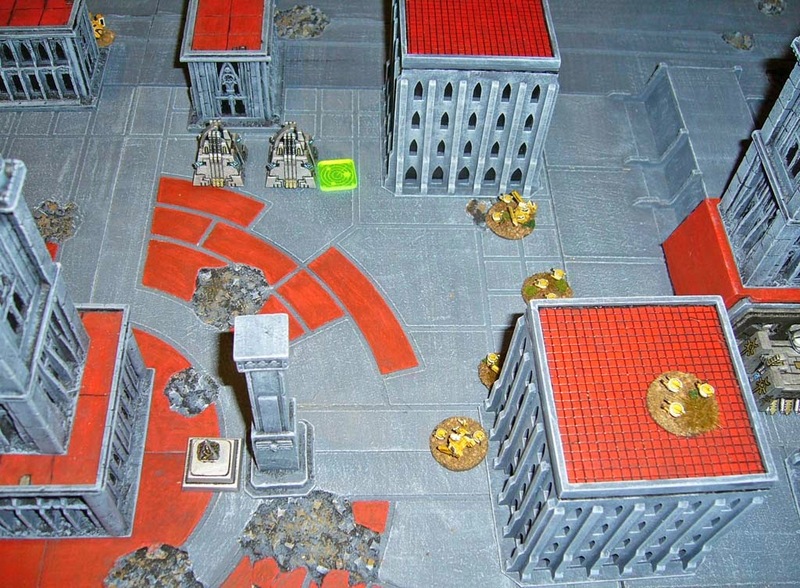 Due to the draw it goes a second round of combat and the Firewarriors break and retreat. My battered Phalanx retreats back through a portal and into stasis. 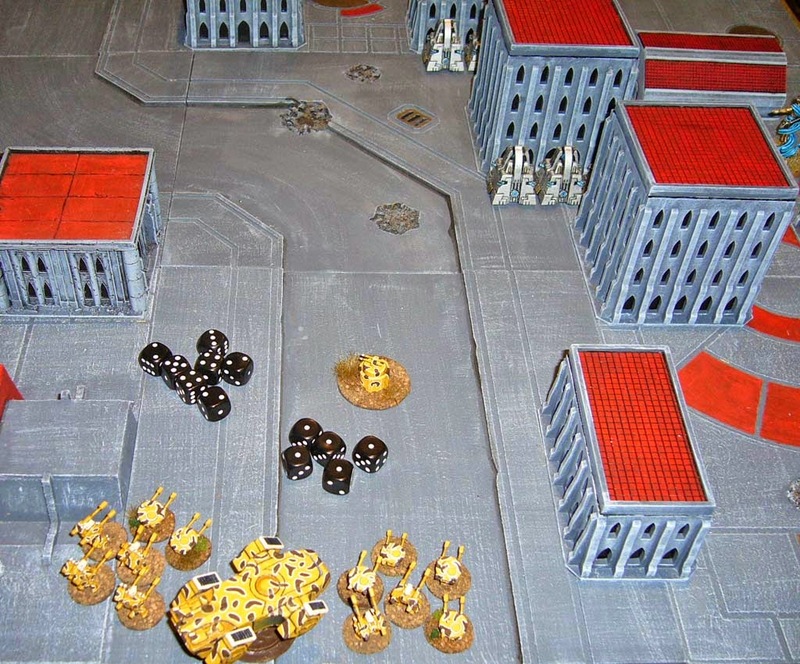 The Tau conduct a co-ordinated fire mission with seeker missiles but it does no damage. I then double and shoot with a Monolith formation at the landed Orca, before engaging with my last Phalanx against one of the Broadside formations and the Orca. This doesn't go well, I lose 3 units and break and exit via portal, killing none of the Broadsides in return. 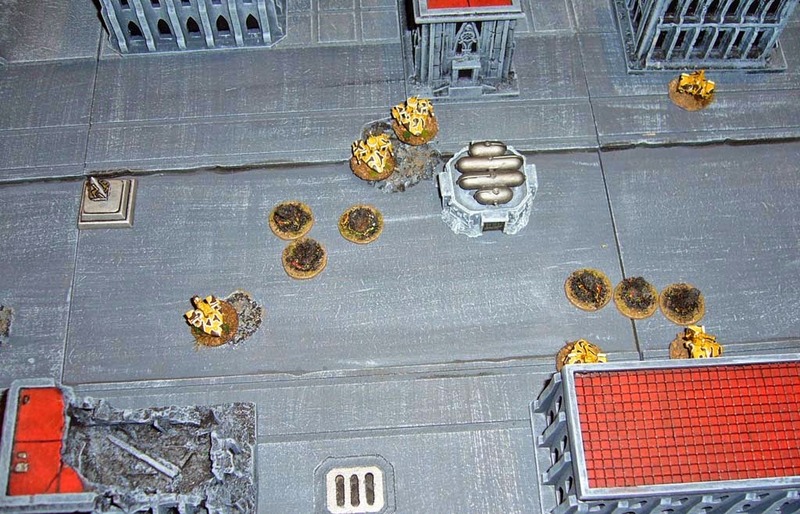 Another Tau Orca with Crisis Suit Cadre lands and opens fire killing another Monolith from the broken formation near the city centre. 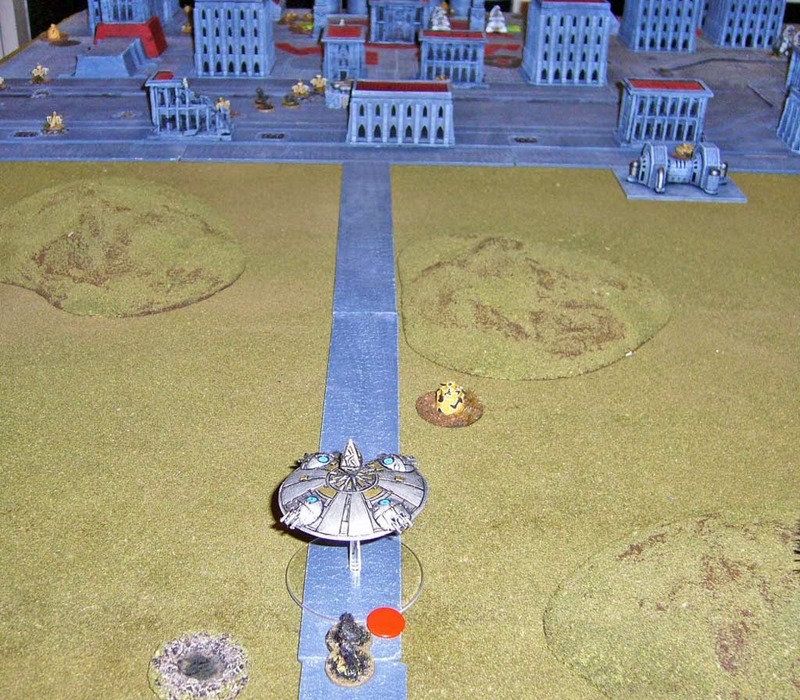 My Aeonic Orb doubles off down the road heading towards the city, though bashing into some ruins and taking a point of damage as it lifts off out of them... stupid flying saucers! The Aeonic Orb opens fire with the solar flare, not killing any units but placing 3 blast markers each on two Tau Recon formations. 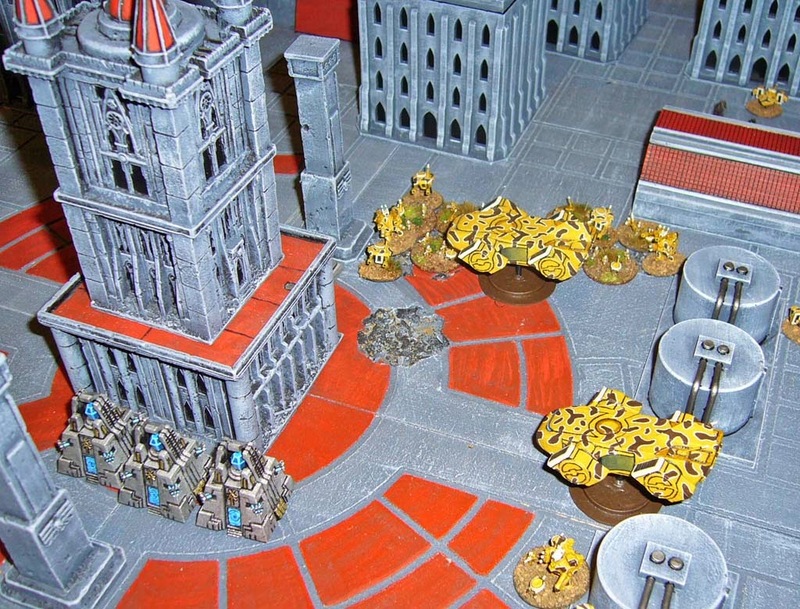 The Tau Broadsides that were on overwatch in the city centre move and fire and kill the last Monolith from the broken formation. 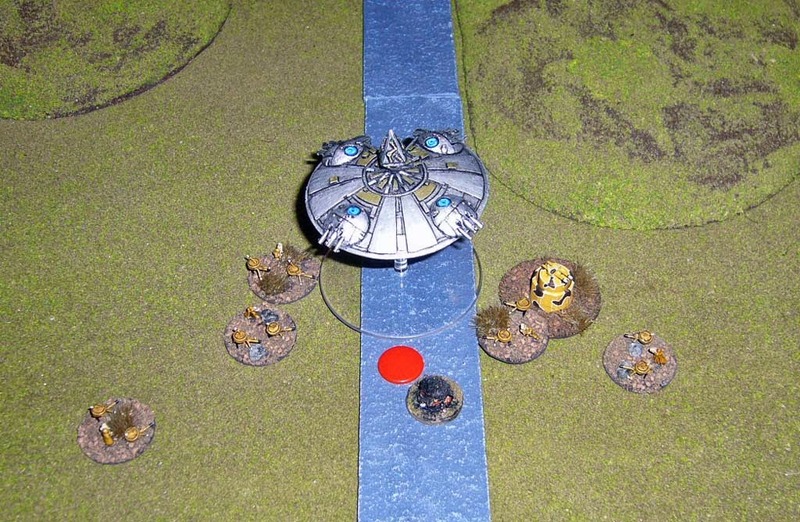 Then another Orca arrives and air transports the Broadsides and broken Firewarriors off the table. End of turn 1. I have a lost a Monolith formation, but my other formations all rally and the Phalanxes regenerate a unit each. The Tau have lost a recon formation and the Firewarrior Formation remains broken offboard. 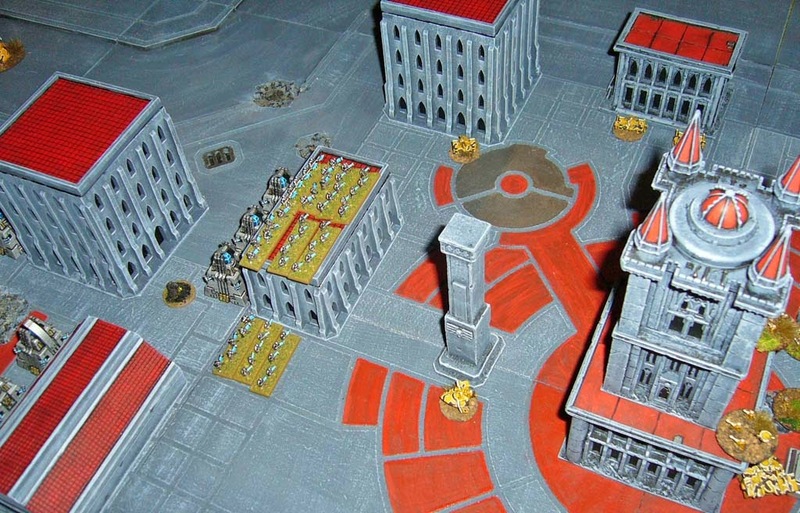 I teleport my Obelisks onto the Tau Blitz objective. 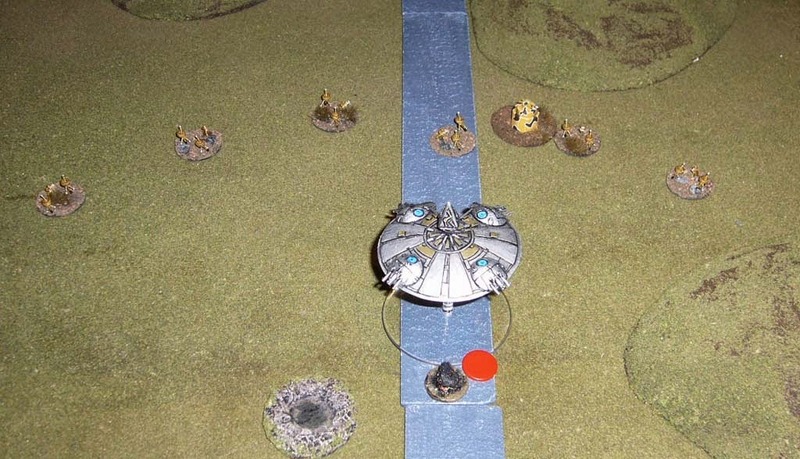 Tau Stealth teams teleport in front of the Aeonic Orb to slow it down, also bringing it into their zone of control so it can't sustain fire. 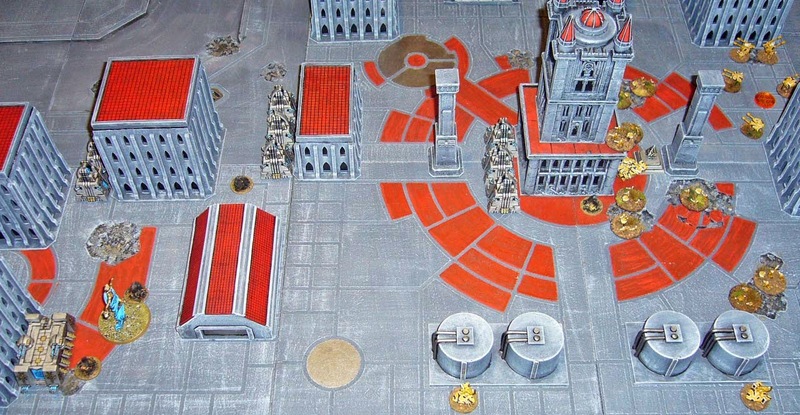 The other Tau Steath formation arrives in the centre of the city, annoying all my formations here by bringing them into their zone of control. Tau win the Strategy Roll. 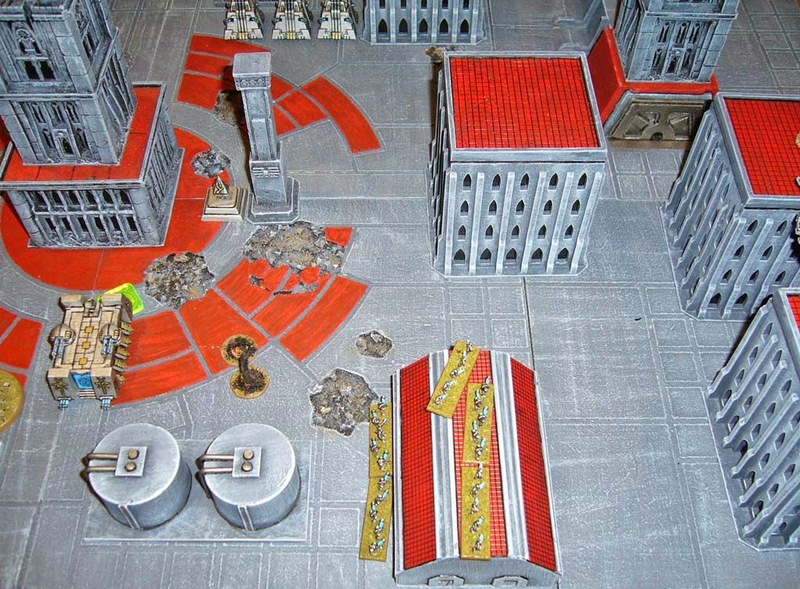 The Tau Crisis Cadre moves towards their Blitz and shoot the Obelisks but only place a blast marker. Recon formations miss too and my Obelisks return fire is also ineffective. A Broadside formation then moves and shoots my Warbarque doing a point of damage and breaking it, and then the Deceiver is also broken. 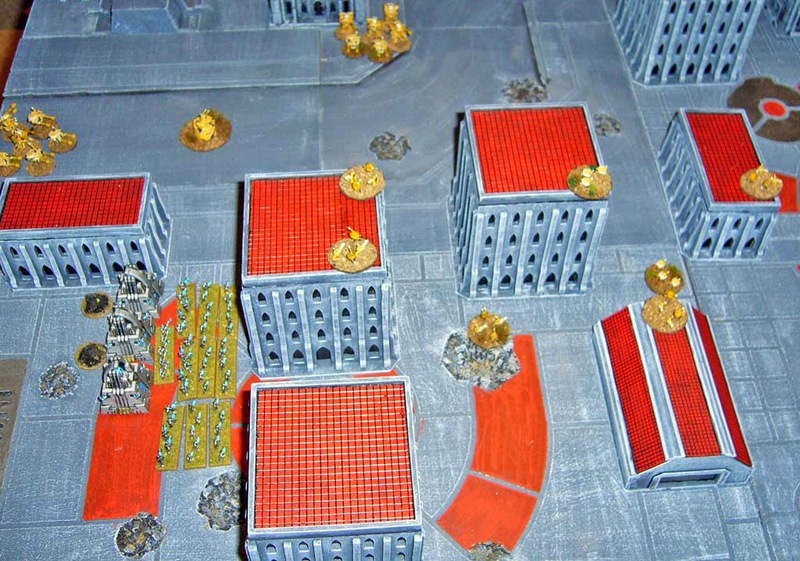 Warbarque and Deceiver move towards the city centre. My Monoliths move out of sight of the other Broadside formation and then a large Phalanx portals in and engages the Stealth teams, wiping them out with the assistance of support fire, before exiting via portal again. 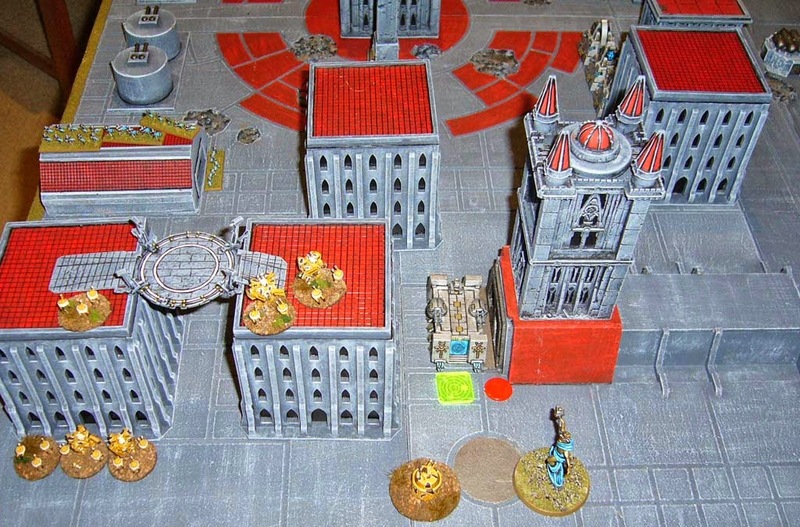 The other Tau Broadside team moves and shoots at the Monoliths at this end of the city, killing one. 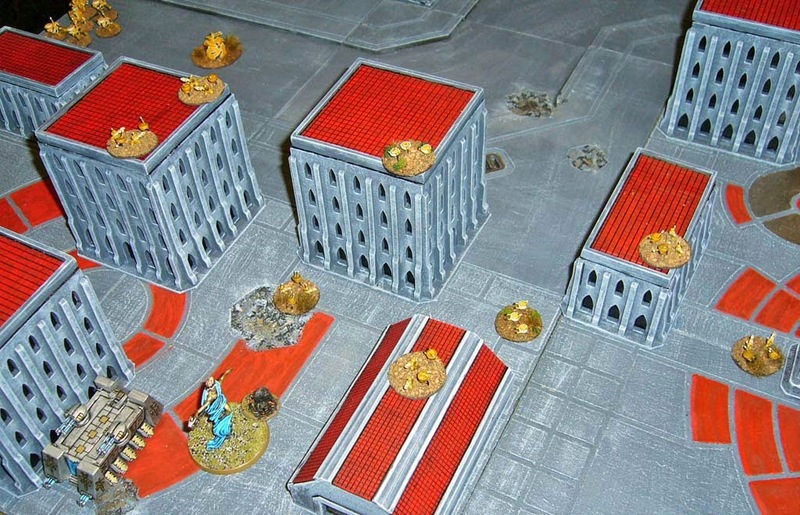 The remaining two Monoliths retreat towards the city centre. My Aeonic Orb engages the Steath teams, but this goes wrong and I lose the combat! Should have just moved and shot the damn Stealth formation! The Orb retreats but still manages to end a little closer to the city. The Stealth teams follow and continue to harrass it. An Orca arrives with the other Broadside formation, which shoots the Obelisk formation killing three of them and breaking the formation. I move another Monolith formation and portal and engage with a small Phalanx, breaking and almost wiping out another Recon formation, before exiting via portal again. My last Phalanx portals in through the Warbarque, and another Tau Recon formation is practically destroyed. This Phalanx stays on the board. 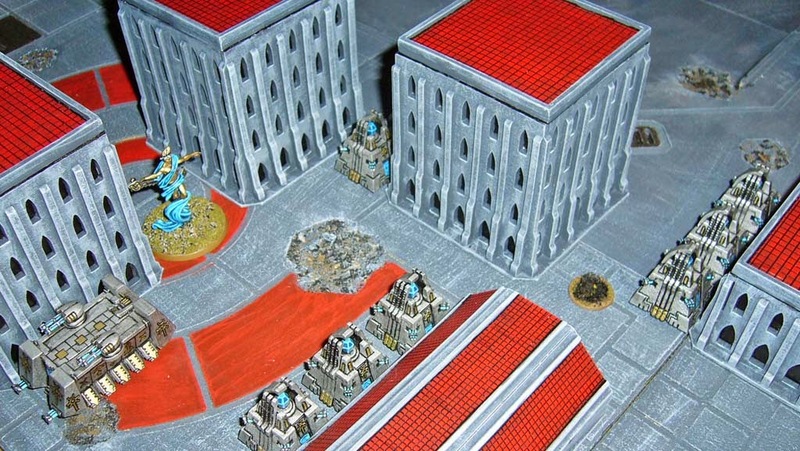 I teleport The Deceiver back onto the board near the Tau Blitz objective. Tau win Strategy Roll again. 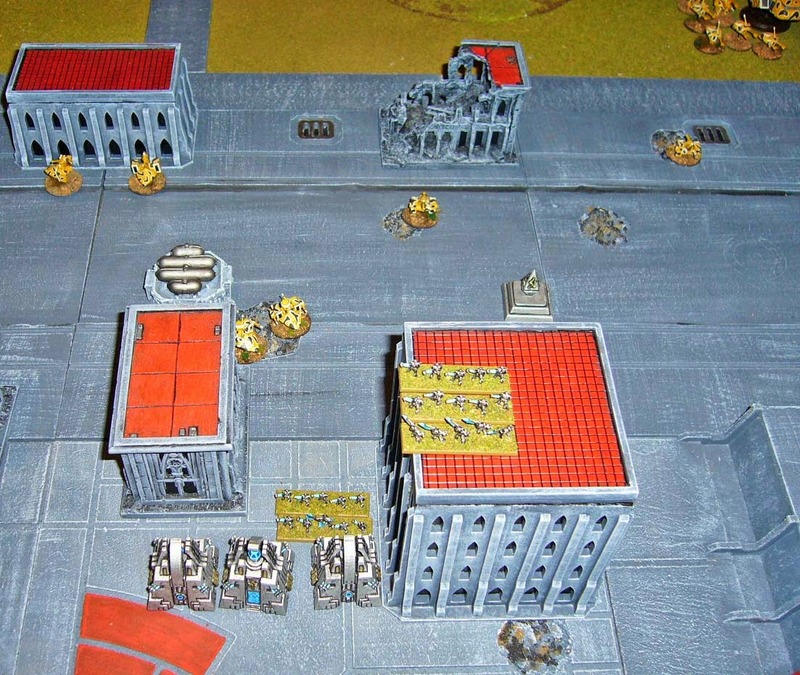 The Tau Crisis Cadre moves and fires at my one remaining Monolith Formation in the city, killing one Monolith and breaking the formation but they stay where they are. An Orca with two Broadside formations arrives and they fire at the Monoliths scoring 10 hits. By a stroke of fortune I only lose one Monolith though! My large Phalanx engages from the Warbarque's portal, wiping out the Crisis Cadre. 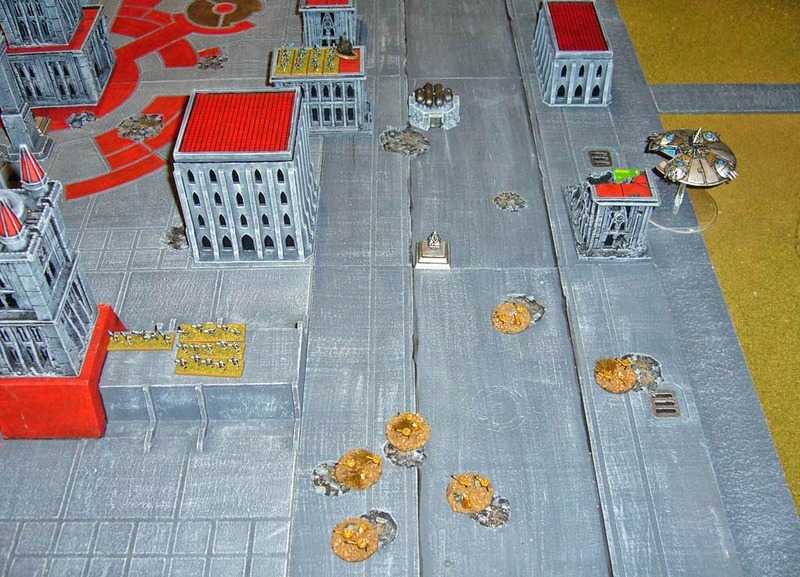 Another Phalanx engages from the remaining lucky Monolith and wipes out the last Tau Recon formation. I now have both Take and Hold objectives and the Blitz so temporarily have two victory conditions. 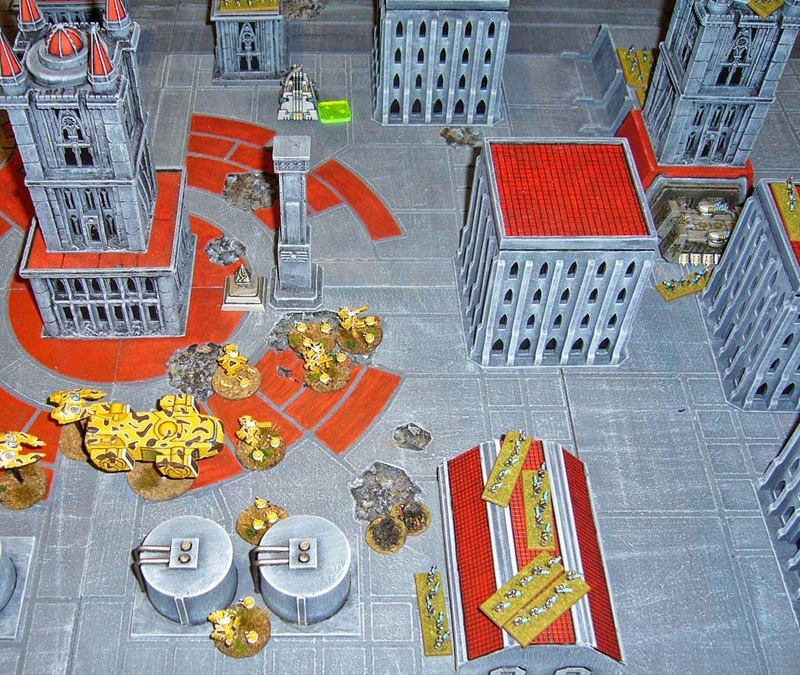 But the second Tau Crisis Cadre arrives by Orca at the city centre, opening fire and breaking the Phalanx here before it can activate, and reclaiming the a Take and Hold objective. At my Blitz objective another Phalanx and the Monoliths fail to hold off more air attacks and the Tau capture my own Blitz. Tau Steath Teams march to contest the other Take and Hold objective I had temporarily captured. I am out of activations and so are the Tau. 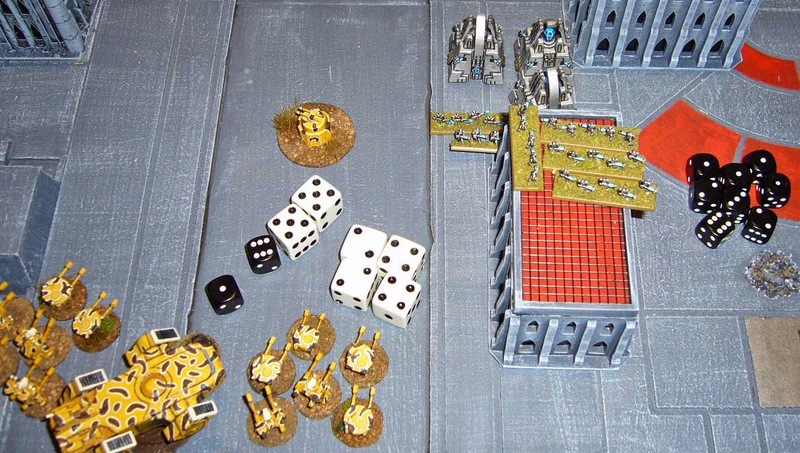 Game over, 2 victory conditions to the Tau (Take and Hold and Blitz), and 1 victory condition to the Necrons (Blitz). This is why I should never try to work from home! Excellent game Mark, there seems to have been things popping up and disappearing all over the place, and fantastic set up. 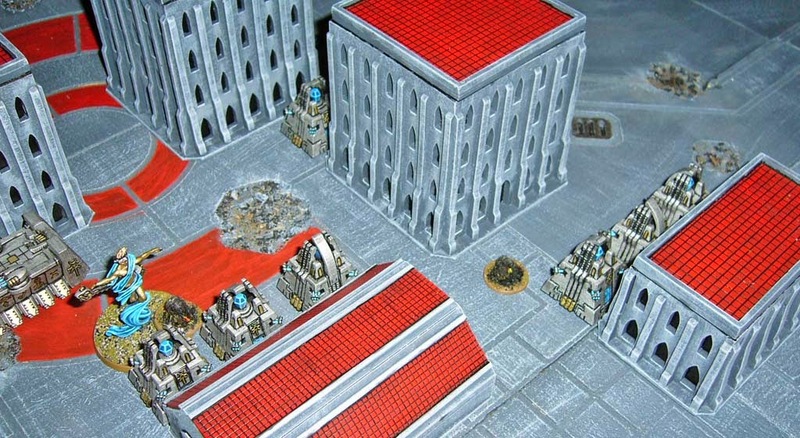 That city looks amazing, as do your Necrons.